Welcome to the UK is the fascinating answer to how you put on a play by a collaborative cast who don’t all speak the same language. The result is heavy on humour and pathos, sometimes light on dialogue, Sometimes confusing, this Dadaesque play examines the way the system of immigration feels for those trapped in it. Decisions that make no sense control your every waking moment, your destiny, your right to live and die. 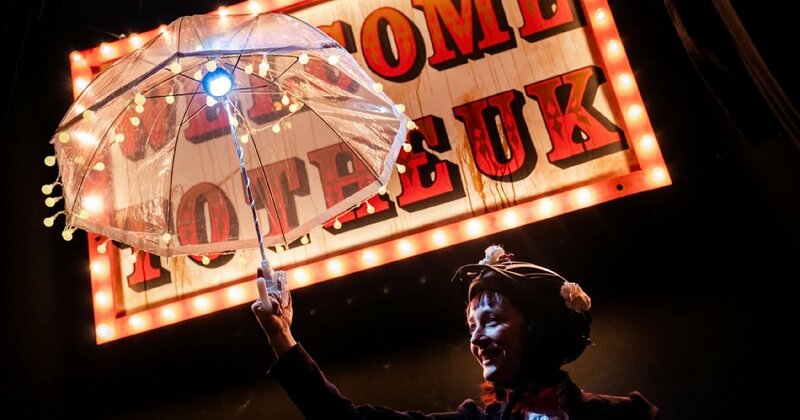 The play is set in a circus (which heightens the surrealities) and fairground (which heightens the sense of menace) with a ringmaster based on a cross between Theresa May and the Wicked Witch of the West. It tells a dizzying number of stories from people of many different countries of origin now trying to make it in the UK. Covering a range of different exploitations from the black economy to sexual slavery the play is rescued from being simply too depressing by the humour of the actors – all refugees themselves. There isn’t a linear plot though – just a series of snapshots. Which can sometimes be confusing to follow. My main criticism would be that the direction doesn’t take proper account of the space it’s set in. For a play so willing to break rules, it was odd that so much was played forward while the theatre was in the round. But this is a small detail next to the big feeling the play induces. Guilt for the system we allow is both encouraged and lampooned. But you still leave with a passionate desire to do better.